I share this story in hopes that it will touch someone’s heart and assure them that they are not alone. On the morning of May 17, 2006, I prepared to leave work for my routine ob-gyn appointment. When I got into the exam room, unbeknownst to me, my blood pressure was 150/110. Ok, so??? The nurse practitioner was having trouble finding our little precious one, so she called the doctor in. I’ll never forget his cold, heartless words, “Sorry, but she’s gone.” WHAT DID I JUST HEAR?! He tells us our daughter is gone and then goes to sit in the corner. 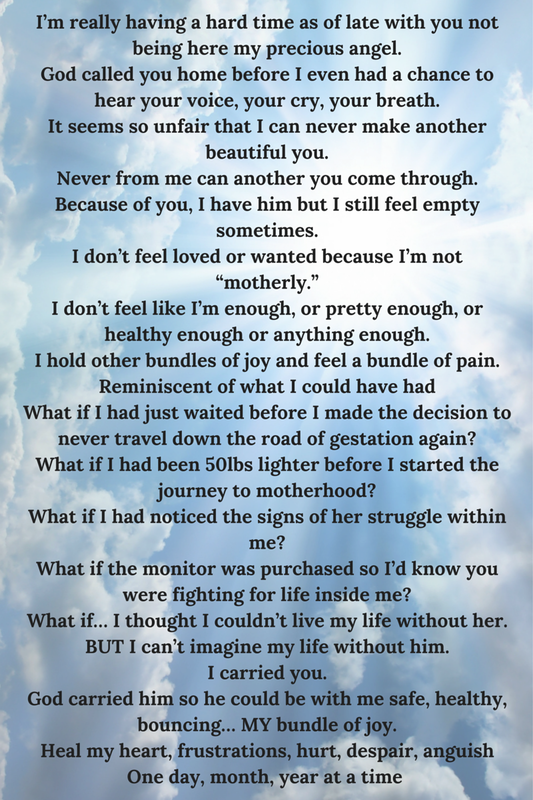 On May 19, the day our daughter was stillborn. Our hearts were broken into minute pieces so small a microscope wouldn’t be able to detect them. I pushed through the natural labor and the silence in the room was more like a full marching percussion section. It was real now. She really wasn’t going home with us. We had already had one of the showers. I can’t go home without a baby. It was unreal…this ordeal. I wanted to ball myself up and be thrown away in any trash heap that could be found. I felt like a failure; like I didn’t do right by my daughter. Our sweet Triniti Lauren needed me and there was nothing I could do to save her. I was helpless. I’m going to blog some more about the aftermath of this tragedy and how grief almost consumed me – well, it DID consume me, but I had to let go. That’s another story for another blog post. I wanted to encourage women out there who have faced this horrible scenario. How you feel is OK. YOU are OK! No one is allowed to tell you how or for how long you should grieve, but don’t allow your grief to transform itself into a living, breathing being. That’s what I did and that thing took over my life. You will have days when you just want to scream and cry, and that too is OK, but remember ALL things work together for the GOOD of them who love the Lord and are called according to His purpose. His purpose for me and my husband wasn’t to bring our daughter home, but to propel us into a series of events that lead to an atypical miracle. Her life was not in vain and neither are your precious angels. Here a few Healing Words for me, and I pray it blesses you too.